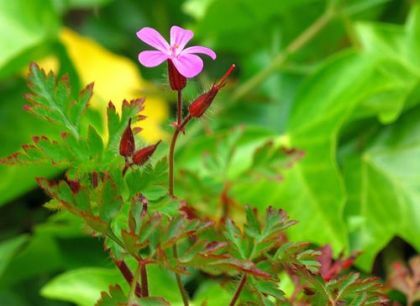 Familiar little pink flower from April to November, Herb-Robert is a hairy, unpleasant-smelling plant which grows on banks, bases of walls, shingle and shady places throughout the country. 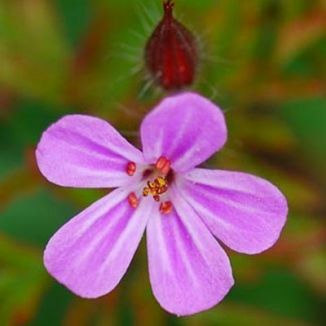 Its pink flowers (8-15mm across) have five un-notched petals and in the centre of the flower are orange anthers. Each petal is marked by small lighter-pink lines running into the centre of the flower. The hairy, stalked leaves are often tinged red and have three to five deeply cut lobes. The fruit is hairy and beak-like. This is a native plant belonging to the family Geraniaceae. I first identified this plant growing in Dundrum, Co Dublin in the early 1950's and I photographed it in Gibletstown, Co Wexford in 2005. This plant has been introduced into North and South America from Europe and Asia. In traditional medicine in the Americas it has been used to stop nosebleeds. Its leaves are also made into a herbal tea which is recommended as a gargle and an eyewash. (I cannot recommend this course of action). One wonders who is the 'Robert' of this plant. Maybe the name comes from the Latin word 'ruber' meaning red which may have referred to the colouring of the leaves and stems.